Meikles Limited Notice to Shareholders: Notice by the Directors of Meikles Limited. The Directors of Meikles Limited wish to advise shareholders that discussions to sell certain of its hospitality assets are ongoing. Meikles Limited, Notice to Shareholders: Amended Scrip Dividend Timetable Notice. Meikles Limited Dividend Scrip Offer to Shareholders. Meikles Limited Dividend Declaration Notice . Meikles Limited, Notice to Shareholders: Notice of the results of the Annual General Meeting held on 20 November 2018. The Abridged Unaudited Financial Results for the Half Year Ended 30 September 2018 by the Chairman. The report for the financial year ended 31 March 2018, is presented with the chairman's report for the year. Notice is hereby given that the eighty-first ANNUAL GENERAL MEETING of the shareholders of Meikles Limited in respect of the year ended 31 March 2018. The report for the financial half year ended 30 September 2017, is presented with the chairman's report for the year. The report for the financial year ended 31 March 2017, is presented with the chairman's report for the year. 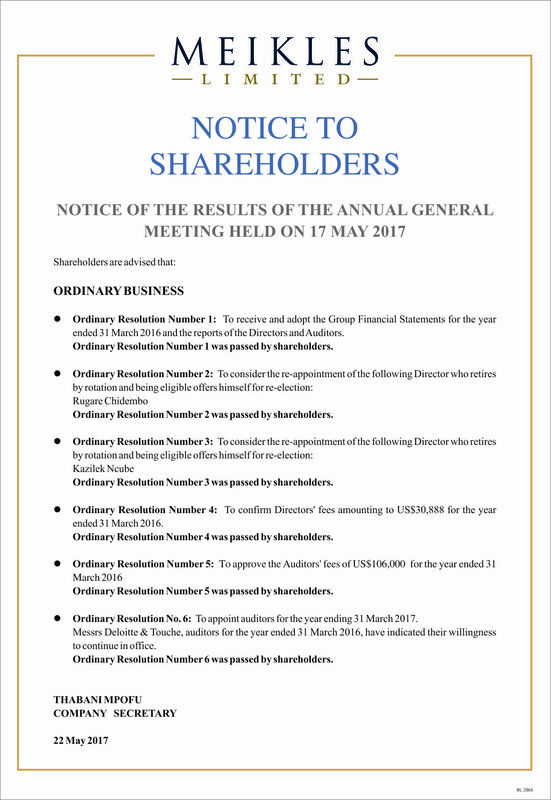 Shareholders are referred to the Cautionary Statement released by Meikles Limited ("Meikles") on 8 March 2017, 7 April 2017, 5 May 2017 and 2 June 2017. Your Chairman and colleagues visited the Minister of Finance and his colleagues on two occasions. The Governor of the Reserve Bank of Zimbabwe was present at the first of the two meetings. The report for the financial year ended 31 March 2016, is presented excluding sums considered due to the Company by the Government of Zimbabwe. The Directors of Meikles Limited wish to advise shareholders that the Company is currently engaged in discussions on a transaction that may have material impact on the value of the Company’s shares. The operating environment was characterised by a number of impediments, the main ones being cash shortages and delays in settlement of obligations to foreign suppliers.